Below you fill find all funeral homes and cemeteries in or near Detroit. Popular neighborhoods in Detroit include: Arden Park-East Boston Historic District, Atkinson Avenue Historic District, Black Bottom, Boston-Edison Historic District, Brush Park, Cass Corridor, Corktown Historic District, Cultural Center Historic District, East Ferry Avenue Historic District, Delray, Eastern Market, Detroit, Grand Circus Park Historic District, Greektown, Detroit, Indian Village, Lafayette Park, Detroit, New Center, North Corktown, Parkland, Poletown, and Virginia Park Historic District. Suburbs of Detroit: nergy, DTE Energy Brm, General Motors, Hamtramck, Kelly Services Inc, Royal Oak Twp. Detroit is also known as: Motor City, Hockeytown, Arsenal of Democracy, Motown, and The D.
Their current mayor is Mayor Mike Duggan. Zip codes in the city: 48201, 48202, 48203, 48204, 48205, 48206, 48207, 48208, 48209, 48210, 48211, 48212, 48213, 48214, 48215, 48216, 48217, 48218, 48219, 48220, 48221, 48222, 48223, 48224, 48225, 48226, 48227, 48228, 48229, 48230, 48231, 48232, 48233, 48234, 48235, 48236, 48237, 48238, 48239, 48240, 48242, 48243, 48244, 48255, 48260, 48264, 48265, 48266, 48267, 48268, 48269, 48272, 48275, 48277, 48278, 48279, 48288. There are currently 78 funeral options for this city. Detroit has been featured in films like: Sicko (2007), 8 Mile (2002), Hoffa (1992), and RoboCop (1987). Some of the notable people born here have been: Sid Meier (game designer and programmer), Jeffrey Sachs (scientist and economist), Jeffrey Eugenides (writer and novelist), , Wendy Hamilton (actor and model), , William Clay Ford, Jr. (businessperson), Jerome Bettis (american football player), and Kathe Koja (novelist and writer). 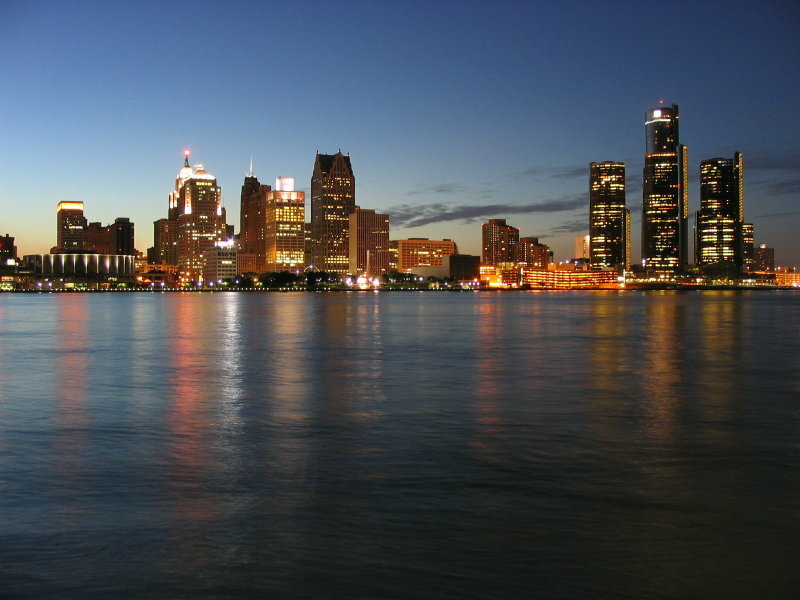 Detroit is home to the following sports teams: Detroit Tigers, Detroit Lions, and Detroit Red Wings. Detroit (/dɨˈtrɔɪt/) is the most populous city in the U.S. state of Michigan and the largest city on the United States–Canada border. It is the seat of Wayne County, the most populous county in the state. 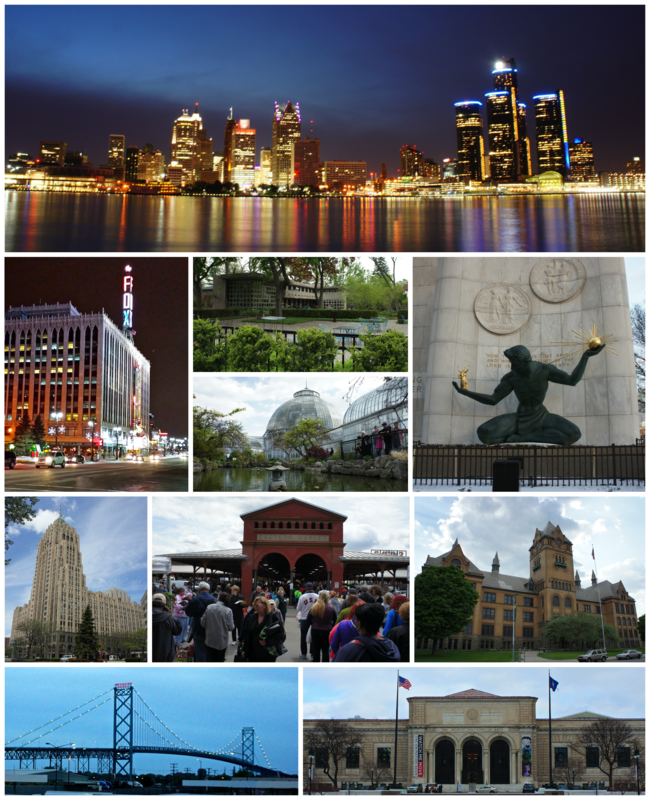 Detroit's metropolitan area, known as Metro Detroit, is home to 5.3 million people, making it the fourteenth-most populous metropolitan area in the United States and the second-largest in the Midwestern United States (behind Chicago). It is a major port on the Detroit River, a strait that connects the Great Lakes system to the Saint Lawrence Seaway. It was founded on July 24, 1701, by the French explorer and adventurer Antoine Laumet de La Mothe, sieur de Cadillac and a party of settlers. 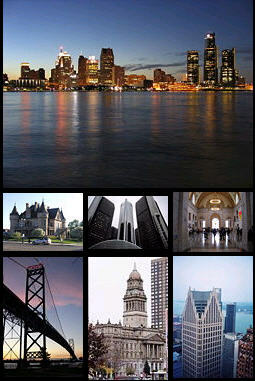 The City of Detroit anchors the second-largest economic region in the Midwest, behind Chicago, and the thirteenth-largest in the United States.With expansion of the automobile industry, the Detroit area emerged as a significant metropolitan region within the United States in the early 20th century, when the city became the fourth-largest in the country for a period. In the 1950s and 1960s, expansion continued with construction of a regional freeway system. Detroit is the center of a three-county urban area (population 3,734,090, area of 1,337 square miles (3,460 km2), a 2010 United States Census) six-county metropolitan statistical area (2010 Census population of 4,296,250, area of 3,913 square miles [10,130 km2]), and a nine-county Combined Statistical Area (2010 Census population of 5,218,852, area of 5,814 square miles [15,060 km2]). The Detroit–Windsor area, a commercial link straddling the Canada–U.S. border, has a total population of about 5,700,000. The Detroit metropolitan region holds roughly one-half of Michigan's population.Known as the world's automotive center, "Detroit" is a metonym for that industry. Detroit's auto industry, some of which was converted to wartime defense production, was an important element of the American "Arsenal of Democracy" supporting the Allied powers during World War II. It is an important source of popular music legacies celebrated by the city's two familiar nicknames, the Motor City and Motown. Other nicknames arose in the 20th century, including City of Champions, beginning in the 1930s for its successes in individual and team sport; The D; Hockeytown (a trademark owned by the city's NHL club, the Red Wings); Rock City (after the Kiss song "Detroit Rock City"); and The 313 (its telephone area code).Due to industrial restructuring and loss of jobs in the auto industry, Detroit lost considerable population from the late 20th century to present. Between 2000 and 2010 the city's population fell by 25 percent, changing its ranking from the nation's 10th-largest city to 18th. In 2010, the city had a population of 713,777, more than a 60 percent drop from a peak population of over 1.8 million at the 1950 census. This resulted from suburbanization, industrial restructuring, and the decline of Detroit's auto industry. Following the shift of population and jobs to its suburbs or other states or nations, the city has focused on becoming the metropolitan region's employment and economic center. Downtown Detroit has held an increased role as an entertainment destination in the 21st century, with the restoration of several historic theatres, several new sports stadiums, and a riverfront revitalization project. More recently, the population of Downtown Detroit, Midtown Detroit, and a handful of other neighborhoods has increased. Many other neighborhoods remain distressed, with extensive abandonment of properties. The Governor of Michigan, Rick Snyder, declared a financial emergency for the city in March 2013, appointing an emergency manager. On July 18, 2013, Detroit filed the largest municipal bankruptcy case in U.S. history. It was declared bankrupt by Judge Steven W. Rhodes of the Bankruptcy Court for the Eastern District of Michigan on December 3, 2013; he cited its $18.5 billion debt and declared that negotiations with its thousands of creditors were unfeasible. On November 7, 2014, Judge Rhodes approved the city's bankruptcy plan, allowing the city to begin the process of exiting bankruptcy. The City of Detroit successfully exited Chapter 9 municipal bankruptcy with all finances handed back to the city at midnight on December 11, 2014. It was disclosed on March 31st, 2019 that Marie Antoinette "Toni" Couture passed away in St Petersburg, Florida. Couture was 94 years old and was born in Detroit, MI. Send flowers to express your sorrow and honor Marie Antoinette "Toni"'s life. It was written on March 31st, 2019 that Michael Eder perished in Georgia. Eder was 60 years old and was born in Detroit, MI. Send flowers to share your condolences and honor Michael's life. It was written by Orange County Register on March 31st, 2019 that Jeannette Joan Grelck (Teppa) perished in Lake Forest, California. Ms. Grelck was 97 years old and was born in Detroit, MI. Send flowers to express your sorrow and honor Jeannette Joan's life. It was noted on March 24th, 2019 that Laura L Ziegle (Germain) passed on in The Villages, Florida. Ms. Ziegle was 65 years old and was born in Detroit, MI. Send flowers to share your condolences and honor Laura L's life. It was revealed on March 24th, 2019 that Carolyn Anne Dritsas (Russell) passed away in Sacramento, California. Ms. Dritsas was 82 years old and was born in Detroit, MI. Send flowers to express your sympathy and honor Carolyn Anne's life. It was noted by Orange County Register on March 24th, 2019 that Jack D Miller perished in Brea, California. Miller was 89 years old and was born in Detroit, MI. Send flowers to express your sympathy and honor Jack D's life. It was noted on March 24th, 2019 that Kenneth Pedersen passed on in Detroit, Michigan. Pedersen was 81 years old. Send flowers to share your condolences and honor Kenneth's life. It was noted by Sarasota Herald-Tribune on March 23rd, 2019 that William Ronald "Bill" Wiseman passed away in Bradenton, Florida. Wiseman was 86 years old and was born in Detroit, MI. Send flowers to express your sympathy and honor William Ronald "Bill"'s life. It was disclosed by Sarasota Herald-Tribune on March 19th, 2019 that Robert Lee Thornton passed away in Osprey, Florida. Thornton was 93 years old and was born in Detroit, MI. Send flowers to share your condolences and honor Robert Lee's life. It was written on March 14th, 2019 that Dorothy M Morier (Brasseur) passed away in Rancho Cucamonga, California. Ms. Morier was 87 years old and was born in Detroit, MI. Send flowers to express your sympathy and honor Dorothy M's life. The city name comes from the Detroit River , meaning 'the strait of Lake Erie,' linking Lake Huron and Lake Erie; in the historical context, the strait included Lake Saint Clair (North America) St. Because of this local sentiment, many Detroiters volunteered to fight during the American Civil War, beginning with the 'Iron Brigade' which defended Washington, D.C. Detroit passed to the United States under the Jay Treaty (1796). Michigan winters can be rough ... community with continued efforts and outreaches to make Detroit a better place. The church has served as host to many pivotal community events, including the funeral of Civil Rights pioneer Rosa Parks. Funeral Services Detroit MI - Hopcroft Funeral Homes Inc.
Hopcroft Funeral Home Inc. provide funeral arrangement services to families in Detroit, MI and the surrounding areas. Call us today at 248-585-7770. Listing all funeral homes in Detroit, Michigan so you can easily send flowers to any location (same day delivery) or find any funeral service. We work with local florists and flower shops to offer same day delivery. You will find budget sympathy flowers in Detroit here. Our funeral flowers are cheap in price but not in value.